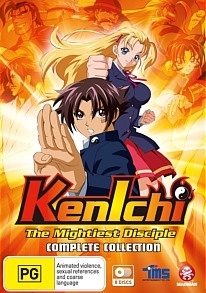 Kenichi the Mightiest Disciple Complete Collection DVD Review Kenichi the Mightiest Disciple is an enjoyable series that can be watched by children and adults alike. This whopping complete collection for Kenichi the Mightiest Disciple runs for a crazy 1250 minutes and collects all 50 episodes from this series in one convenient collection. That's a total of 8 discs! The anime is also based on the Manga collection of the same name and revolves around protagonist and hero Kenichi Shirahama, a 17-year old high school student who has been bullied and picked on throughout his time at school. Yes, Kenichi is a wimp but fate has dealt him an unexpected hand of cards with that of the beautiful Miu. Miu is the stereotypical anime high school girl that obviously her creators had some fun in designing because she has been created for pure fan service, from not just her looks but also her killer personality. Miu is what Kenichi needs to turn his life around for not only does she live in a dojo with six martial arts masters but her goal is turn Kenichi from zero to hero but like all good anime stories, things never go according to plan. Thankfully the creators of Kenichi the Mightiest Disciple set up the main characters well in the first few episodes, especially Kenichi and Miu. As the stories progress and with Kenichi getting his fair share of knocks, our unlikely hero begins his training and even though he starts to get the skills needed to defeat his bullies, he also needs to train his mind and not just his body. For Kenichi, both the mind and body are weak but that's where the lovely Mio comes into the picture. To complicate things for Kenichi, the local gang known as Ragnarok have targeted our newly reformed wimp which causes more angst and pain for him. The best part of Kenichi the Mightiest Disciple is that Kenichi eventually becomes a warrior and both he and Mio are called into action which helps dictate the story as the series progresses. There's even some romance thrown into the mix with anonymous love letters, embarrassing innocent love scenes and even some classic anime cats to help increase the cute factor of this delightful animated series. Just like the series started with a bang, it also ends with a bang that has been accumulating for almost 50 episodes with a fight that would make Dragonball Z look like a kitten. In terms of animation, Kenichi the Mightiest Disciple is rather basic at times but its stylised techniques actually suits the premise perfectly and as mentioned, there's plenty of fan service. The audio quality is quite decent on DVD with vibrant colours, sharp images and a Dolby Digital 5.1 soundtrack. Unfortunately for extras, the series only features a textless opening animation, textless closing animation and a handful of trailers. It would have been great to see a few interviews of those responsible for creating this 50 episode epic. Nonetheless, Kenichi the Mightiest Disciple is an enjoyable series that can be watched by children and adults alike.